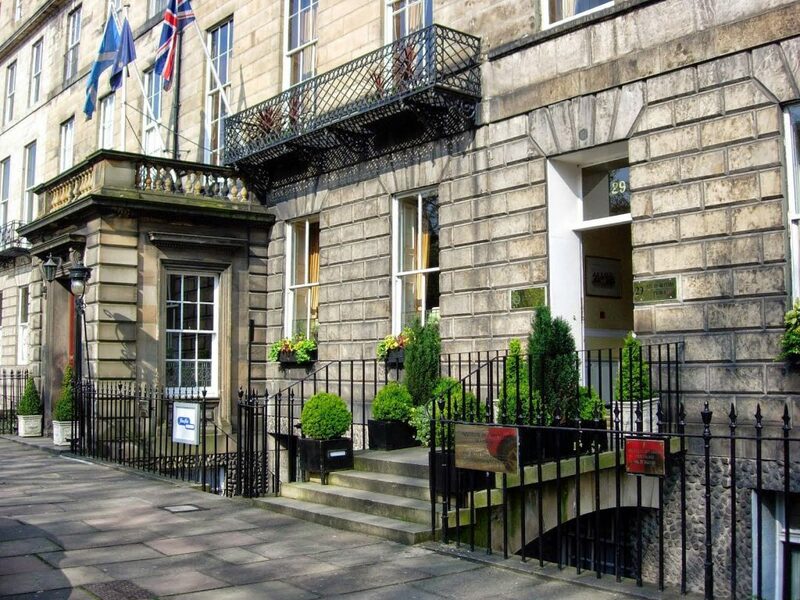 On 10th August 1922 HRH Princess Mary, Colonel-in-Chief, opened The Royal Scots Club in Abercromby Place, Edinburgh. “We devoutly hope that by this club we can keep the memory of the 11,162 Royal Scots we mourn always before us. They gave up their lives so that those at home could live – they fought for their King and country. To all of us here we feel it a great honour that Your Royal Highness, the daughter of our King, should be with us today and take the leading part in this our tribute of love and respect to our fallen comrades.” – Colonel Lord Henry Scott, Chairman of the Regimental committee. The Royal Scots Regimental Depot was located at Glencorse Barracks, Penicuik from 1880 to 1960. 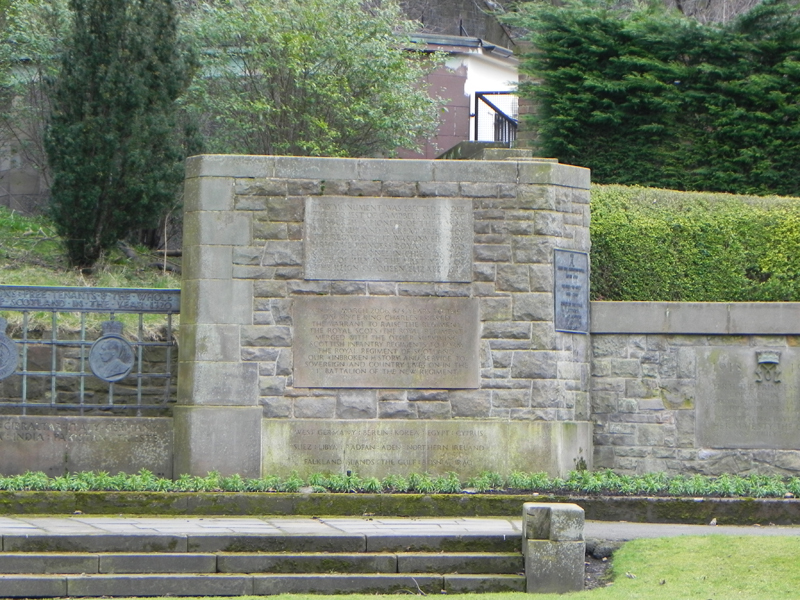 The gates were erected as a Memorial to those Royal Scots who died during the Great War 1914-18. The money to pay for this memorial was raised through the generosity of serving and past officers of the Regiment, old Royal Scots and their friends. The memorial is in the form of wrought-iron gates, supported on circular stone pillars, flanked by small side gates, imposing stone gatehouses and outer wing walls. The opening ceremony was performed on 18 March 1927 by HRH Princess Mary, Colonel-in-Chief. In 2005 the gates were refurbished and a Service of Rededication was held on 11 November of that year. 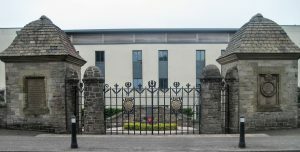 A Garden of Remembrance commemorating all those who served in The Regiment from 1633 to 2006 has been installed behind the Gates. Each year on the Saturday before Remembrance Sunday a short ceremony is held at the Gates and a wreath laid in memory of all Royal Scots who have made the supreme sacrifice. There are a considerable number of memorials to members of the Regiment in St Giles Cathedral, the Regimental church, the Kirk of the Canongate in Edinburgh and churches throughout the Regimental area. 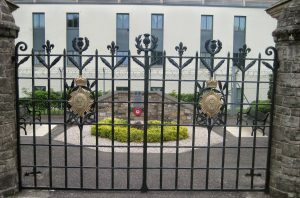 In Rosebank Cemetery, Leith, there is a special memorial to those members of the 7th Battalion killed in the rail disaster at Gretna on 22 May 1915. “It is not for glory or riches, neither is it for honour that we fight, but it is for the sake of liberty alone, which no true man loseth, but at the cost of his own life. Below each of the bronze grilles are recorded all of the countries where the Regiment served in that particular period. 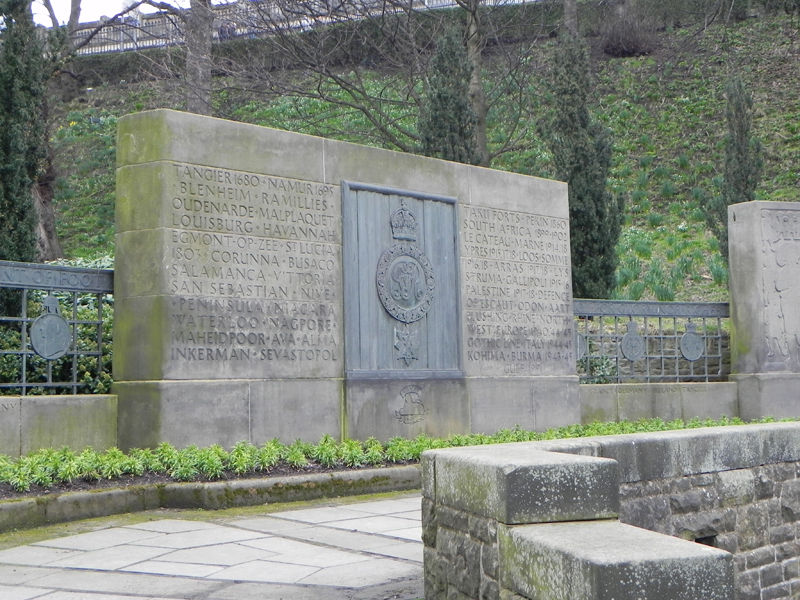 This Regimental Monument was unveiled by HRH Princess Mary, Colonel in Chief on 5 August 1952. On 1 July 1968 HM The Queen unveiled an extension of the Monument in the form of a Memorial to HRH Princess Mary. A Norway Maple and several Golden Cypress Trees were presented to the City of Edinburgh on 22 May 1983 in a small ceremony in Princes Street Gardens to celebrate the 350th Anniversary of the Regiment. On 9 May 2007, HRH The Princess Royal unveiled a final stone plaque to record the end of the Regiment’s history and the formation of The Royal Regiment of Scotland. A bronze plaque to commemorate the event and the 23 years that Her Royal Highness had been the Colonel-in-Chief, was also added. A summary of Twentieth Century RS and non Regimental RS memorials can be found on the links below, these are in pdf. format.